Sport is not only fun and a great way to lead a healthy lifestyle, it can also be a key driver of social change. It can bring together rivals. It can inspire people from disadvantaged backgrounds to be heard and counted. In villages, towns and cities around the world, sport can break down barriers of gender, class, ethnicity and religion. It can create inspiration from unexpected sources, and give people a voice. Here are a few ways sport can challenge negative community attitudes. There are few more famous examples of sport’s ability to bring people together than the 1995 Rugby World Cup in South Africa. Nelson Mandela’s release after 27 years in jail and the fall of apartheid saw tensions peak between black and white South Africans. A year after the first multiracial democratic election in 1994, newly elected President Nelson Mandela decided to use the World Cup to bring the country together. François Pienaar, who was Springboks captain at the time, remembers Mandela’s support for the Springboks during the 1995 Rugby World Cup as a pivotal moment at a time that many feared the country was on the brink of civil war. In communities around the world, sport plays this role every day. Sport can give a voice to people who were not heard in society. American boxing champion Muhammed Ali, who was an outspoken critic of racial oppression and a range of other political issues, said sport gave him the platform to speak about issues. Sport not only gives people a platform, it inspires confidence. It can also provide an outlet which helps children to express themselves. Coupled with the social interaction of team sports, this can support children in feeling more confident voicing their opinions. Athletes exhibit traits that universally appeal to people, which is why sports are so popular. When people see an individual demonstrate admirable traits such as courage, determination and skill, it can change their perception not only of that person, but the people, community or country they represent. This is especially true in events like the Paralympic Games, which gives athletes with disability an opportunity to shine. Changing perceptions is often the first step in changing the way people are treated in society. In most countries, sport is the most popular form of entertainment. Sports events regularly attract the most viewers on television and sports stars are among the most famous people on the planet. Sometimes, an event that happens on the sporting field can spark a national conversation. This happened in Australia when footballer Adam Goodes was racially abused while playing an AFL match. He used the experience to address the issues facing indigenous Australians, and was named the Australian of the Year. Athletes and sporting bodies are increasingly using this profile to raise awareness about issues they care about. Major sporting events like the Olympic Games, FIFA World Cup and Rugby World Cup often use their profile to promote causes such as tackling inequality and poverty. This exposure can make people more aware about human rights injustices, which is a first step in bring bringing about positive change. The power of sport to challenge negative community attitudes is centred on its ability to unite people around a common cause. By building bridges and creating connections, sport becomes a platform to give voice to the disenfranchised, and change perceptions about those marginalised in the community. 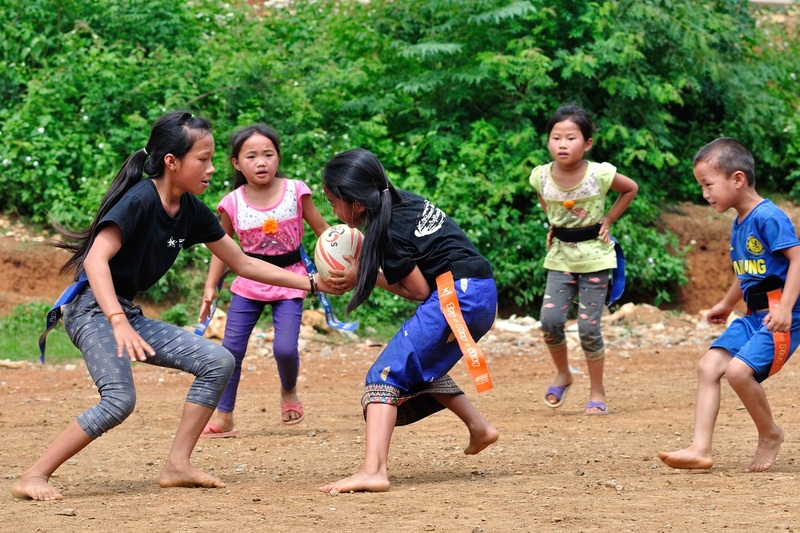 As the principal charity partner of World Rugby for Rugby World Cup, ChildFund is using the power of sport to build a better future for disadvantaged children in Asia. Together, we are equipping children and young people to overcome challenges, inspire positive change, and ‘pass it back’ to their communities.